Summary: Learn how to fit a loft ladder and enlarge a loft hatch. 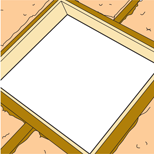 Most modern houses are fitted with an access point to the attic in the form of a hatch in the ceiling. 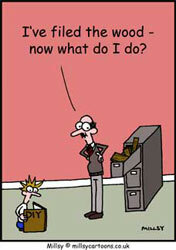 To make it easier to access the loft you may want to fit a loft ladder. Most attic hatches are fitted between the ceiling joists, which are usually far enough apart to accommodate a person and ladder. The main problem is that the hatch is often not long enough, and needs to be made bigger. The hatch should be approximately 760mm (2 ft 6in) in length and 510mm (1ft 7in) in width. Most ladders need about 1.1m (3ft 6in) above the loft floor to pivot, so you may want to consider a fold-up ladder. Whatever the type of ladder you choose, read the manufacturer's instructions carefully before commencing work. Set up a portable light in the loft space. Pull back the loft insulation from between the joists. Start by removing the existing hatch. Prise away the trim around the opening of the loft and the stops on the inside of it. The lining fitted to the inside of the opening must also be removed. 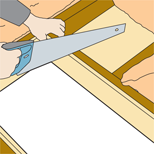 Use a panel saw to saw through the centre of the lining and prise it away from the joists. You will then need to cut through one trimmer (the timber that with the joists make up the shape of the hatch) and knock it out carefully with a hammer, avoiding damage to the ceiling. Having consulted the manufacturer's instructions, from the remaining trimmer measure the length of the new hatch and mark a squared line on the joists. Cut the new trimmer to the required size from timber with the same dimensions as the joists. Align the new trimmer against the squared lines on the joists and nail it in position. From below, fix the ceiling securely to the new trimmer with plasterboard screws. Open up the hatch area by cutting away the excess board until it is flush with the edge of the new trimmer. Cut new lengths of lining and fix around the inside edge of the hatch opening. According to the manufacturer's instructions fix the loft ladder pivots to either the top edge of the trimmer or to its face. Then fit the loft ladder to the pivots and test that it operates smoothly. Cut and fix new trim around the hatch opening to conceal the joints between the lining and ceiling. Mitre the corners to produce a neat finish. You will now need to make a new hatch cover from 18 mm (1/3 in) MDF. Once again follow the manufacturer's instructions, as the hatch may have to be fitted to the bottom of the ladder, so the hatch automatically closes when the ladder is raised. Finally, replace the loft insulation around the new hatch. 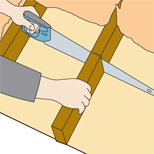 Use a panel saw to saw through the centre of the lining and prise it away from the joists. Cut through one trimmer and knock it out carefully with a hammer.